The Green Flag Award scheme is the benchmark national standard for parks and green spaces in the UK. Universities boasting this status are few and far between and Nottingham Trent University’s award can be attributed to a number of factors including best practice, adding value to the biodiversity of the university’s estate, excellent engagement with staff, students & volunteer groups and a dedicated commitment towards enhancing the regeneration of the university estate. As you can imagine, the Green Flag status places a great expectation on the university to keep the facilities up to a certain standard and this is achieved with a little help from SISIS turf maintenance machinery. “I’ve been in the industry for over 30 years and I’ve always had a good relationship with SISIS. I’ve always known that they build solid machines and I’ve never once had an issue with their equipment,” said Alan Horgan, landscape services co-ordinator for the university. Alan oversees a team of ten which is divided across the university’s three campuses; Clifton, City and Brackenhurst. Based at the main campus - Clifton, Alan and a selected team tend to five natural pitches catering for football, cricket, rugby and American football, five tennis courts, a sand dressed synthetic pitch and a 3G synthetic pitch. 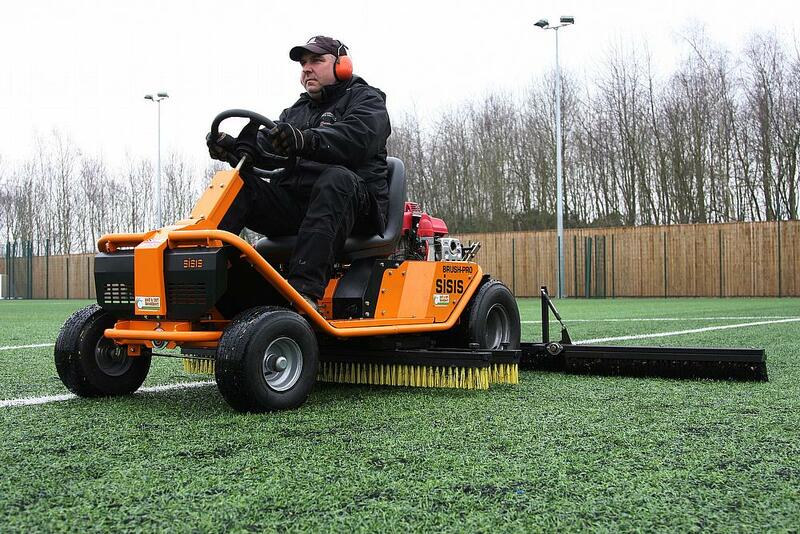 To help the team with their maintenance programmes, they have an impressive line-up of SISIS machinery including the Brush-Pro, SSS1000 sweeper and Zig-Zag brush for all synthetic surface maintenance. For their natural pitches they use a SISIS Maxislit – a tractor mounted deep slitting lawn aerator for the university’s football, rugby and cricket pitches and the Supaturfman - an independently powered heavy duty aerator which is ideal for improving the health of the university’s cricket pitch. “We needed a quality machine that was going to do exactly what it said on the tin and that is why we chose the SISIS Brush-Pro. We first heard about the Brush-Pro partly through word of mouth and partly through research. This led us to look at the SISIS website, where we read reviews and looked at videos of the machine in action. After being impressed we had a demo here through our local SISIS dealer, Platts Harris, and the decision was made to purchase one,” said Alan. It is easy to see why Alan was so impressed. Small enough to manoeuvre through a single gate, yet capable of performing the required daily or weekly maintenance activities to keep a synthetic surface in perfect shape, the Brush-Pro ride-on system has been specifically designed for maintaining synthetic surfaces. It consists of a pair of mid-mounted oscillating brush units for periodic aggressive maintenance and foldable rear mounted brushes spreading 3 metres for more regular maintenance, which means fewer passes are needed compared to more conventional drag brushing, causing less surface compaction. At just a year old, the synthetic pitch is already seeing an average of 76 hours playing time per week and Alan believes that the maintenance of synthetic turf pitches is just as important as the maintenance of natural pitches. Failure to regularly remove dirt, leaf debris and other detritus from a synthetic surface can lead to contamination of the infill, which in turn prevents rainwater from draining freely through the carpet. “The SISIS Brush-Pro gives a nice even distribution of the rubber crumb. You can use it with the oscillating brush underneath, and so if you just need to give it another vigorous brush then you can. Alongside the Brush-Pro we also use the SSS1000, mainly in autumn to collect leaves. For more news, reviews and insightful views, you can follow SISIS on Twitter @SISISMachinery and like the company’s Facebook page – www.facebook.com/SISISMachinery. You can also view the latest SISIS videos by visiting www.youtube.com/SISISMachinery.